VMware vMotion is a vSphere feature that allows you to move a running VMware virtual machine from one host to another, with no significant impact on your production environment. VMware vMotion was introduced in 2003 and is now a part of almost all VMware vSphere editions, except for vSphere Essentials Kit, which is designed for small virtual environments. There are a number of scenarios when VMware vMotion might be helpful, starting with pre-defined hardware maintenance when you need to move your VMs to another ESX(i) host for a short period of time without downtime, and to proactive migration of live VMs away from underperforming servers. If your vSphere licensing includes VMware vMotion, congratulations, you are one lucky virtualization admin! But what should you do if your vSphere license doesn’t offer this feature, OR if you need just need this feature for a one-time project? In this case, Quick Migration from Veeam might be your solution. Prior to performing Quick Migration, add your source and target ESX(i) hosts to the inventory tree in the Veeam Backup console. User interface is almost obvious, so there should not be any problems with that. However, if you want to be sure that everything is correct, follow this guide. Done. The next question: How do I migrate my VMware VMs with Quick Migration? The wizard includes several intuitive steps. Quick Migration can be helpful when you need to migrate VMware VMs between VMware ESX(i) hosts without notable interruption and VMware vMotion is not available, OR when you need to move live VMs between separate datastores and vSphere Storage vMotion is not available. 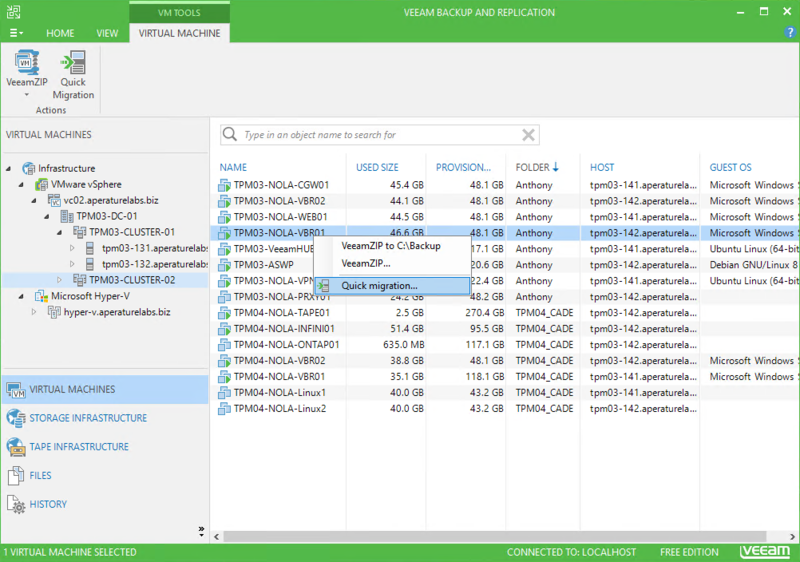 In both cases, Veeam Quick Migration will use its proprietary SmartSwitch technology to help you migrate VMs. Generally speaking, Quick Migration works with VMware VMs in any state, however this feature becomes incredibly valuable when your VM is running and you don’t want to create a large impact on the system uptime due to offline or cold migration. Quick Migration can move several VMware VMs between the source and target simultaneously, not one by one. Quick Migration is only available for VMware, not Hyper-V.
Veeam Backup Free Edition requires at least minimum paid edition of VMware ESXi because of API restrictions in ESXi Free. I hope you will find this post helpful. Feel free to get in touch if you have questions or need assistance.